The Beast 14 has gone through several improvements over the years. It’s a premium, tough running shoe that’s marketed with confidence. The design is ideal for moderate and severe overpronators, providing a supportive and comfortable ride. The latest version of the Beast 14 includes a totally updated saddle. There are also no-sew synthetic overlays, which have the benefit of making the fit more secure. 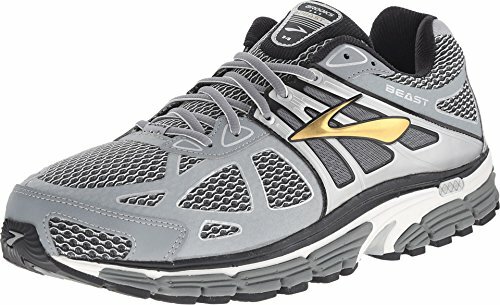 Brooks has long been at the forefront of technologically advanced shoes, and that remains true with this offering. The Beast 14 comes with a full-length cushion along the sole. The unique BioMoGo material adapts to every unique runner’s stride. In addition, the heel-to-toe rollbar allows you to transition smoothly between each stride. The technological innovation doesn’t end there, though. There’s also DNA cushioning gel inside the midsole to provide arch support regardless of your running style. The midsole tech also includes tuned density innovation. This unique feature customizes the ride based on the runner’s gender and weight. The dynamic outsole provides ideal traction over both wet and dry surfaces. There’s durable, high-performance rubber at the forefoot, while the heel has a rubber combination. Flextra rubber helps keep the shoes flexible. One potential drawback is that the shoes tend to be heavier than some other options, so your feet may tire more quickly. The BioMoGo foam is unique due to its biodegradable construction. Unlike EVA foam, the BioMoGo foam is constructed with a key additive that allows it to break down more easily. This makes it an ideal option for runners concerned with the environment. The midsole has omega flex grooves, which enhance the overall flexibility. For overpronators, the diagonal rollbar is a game changer. It uses tri-density foam to increase stability and correct overpronation. The adaptive gel of the DNA Cushioning will adjust in real time to suit a runner’s pace, gait, and weight. Adding to the effect is the segmented crash pad, which absorbs shock and allows smooth heel-to-toe transitions. The upper is constructed with lightweight and breathable Element mesh, helping to manage moisture and increase air circulation. Despite the light weight, the upper is particularly durable. There’s also a moisture-resistant sock liner. An all-new saddle helps improve the fit. The Beast 16 is a motion control shoe that has more cushioning and support than most other models on the market. There have been several updates over the years, including improvements to the cushioning, a revamped upper, and an altered aesthetic. Like the Beast 14, this shoe is designed to help overpronators. There’s also ideal arch support to accommodate flat-footed runners. The design is capable of tackling pavement, indoor floors, and easy trails. It’s a good choice if you’re recovering from an injury. Podiatrists and doctors frequently recommend the model to runners whose biomechanics are imperfect. With that said, it’s not a very fast shoe, but it’s good for training runs. The outsole is made with full-contact rubber. There are uniform lugs positioned along the sole to help with traction. The forefoot is made with soft blown rubber and Flextra rubber, which allows greater flexibility. The rear foot has HPR rubber, which tends to be more durable and rigid. Also part of the outsole is Green Rubber, a traction-improving compound that’s environmentally friendly. The midsole of the Beast 16 has a great deal of cushioning. Instead of having a gel cushion, the shoes employ Super DNA foam. This soft cushion responds intelligently to the runner’s changes in stride. Also included is the same roll bar found in the Beast 14, which helps correct overpronation. The upper comes with synthetic overlays connected to the laces. This improvement helps ensure a more flexible fit. Rather than having the tongue attached to the upper, it’s left free. There’s also a large toe bumper. The heel cup comes with significantly more padding, and the sock liner allows greater breathability. Since the sock liner is removable, you can replace it with customized orthotics. Like the Beast 14, the Beast 16 has a pretty hefty weight. If lightweight shoes are important to you, this might not be the best choice. Heavier shoes can contribute to fatigue as you run. Some people have found the high weight to be difficult to manage. If you’re looking for a stability shoe to help with overpronation, both the Beast 14 and Beast 16 have what you need. The best feature for overpronators is the rollbar, which uses tri-density foam to cushion and correct your stride. The Beast 14 is well-known for its technological innovation. The Beast 16 has much of the same innovation, although there have been some minor changes and improvements. Most people will be served well by the Beast 14, although the heavy heel cushioning in the Beast 16 may appeal to people who experience Achilles tendon pain. As for breathability, the Beast 16 has some minor improvements over its predecessor. The mesh upper has been updated to circulate more fresh air, with an improved inner lining that resists moisture. The sock lining in the Beast 16 is also moisture resistant. It’s important to keep in mind that both of the shoes are on the heavier side, so if you experience fatigue due to high weight, they might not be the best pick. The heaviness can be attributed to the unique rubber construction of the soles.